Orenchi no Furo Jijou episode 5 goes trick or treating for Halloween. Strangely, for a holiday I would imagine Anime could have a ton of fun with (especially by not understanding the cultural details) Halloween is one of those rarely-given-an-episode events. So seeing it here was nice, if not absurdly short like everything Orenchi does. Takasu is dressed as a Witch, because he’s a blonde and that’s his curse! 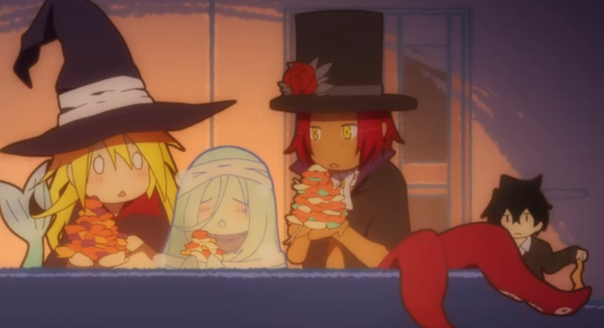 Wakasa is dressed as a vampire and Mikuni goes as a mummy! Since they can’t go anywhere else, they just keep saying Trick or Treak to Tatsumi who dutifully keeps giving them candy. Soon they realize he’s the youngest and should be treated more specially than they. Then its over. Reviewing Orenchi is a bit of an exercise in finding something to say. 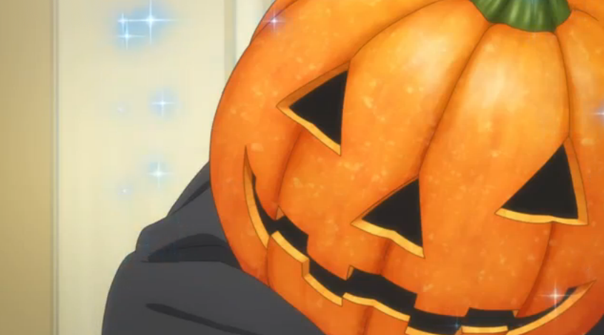 Honestly, there weren’t any jokes this week, unless you count Wakasa wanting to hide his head inside the jack-o-lantern because it’s a small dark space.